In more than forty years of pinstriping and creating signs, there isn’t much that East Coast Artie hasn’t done. With Pro Pinstripe, Artie shares everything he’s leaned during his long career. Find out first hand why Artie chose a particular color combination, or a certain brand of paint for a particular job. 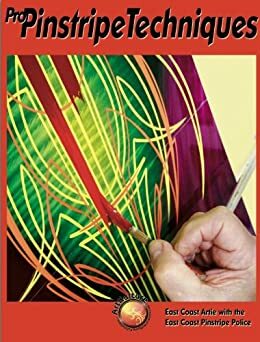 To illustrate how pinstriping works in the real world, the bulk of this new book is made up of 12 start-to-finish pinstriping sequences performed by Artie and a small cadre of guest artists. Each of the guest artists, from Nub, (of Orange County Choppers fame), to Mr. J, Mikey Fredrick, Howie Nisgor, and Zeke Lamanski, have their own style, and their own contribution to this new pinstriping book.